A terry towel is a textile product which is made with loop pile on one or both sides generally covering the entire surface or forming strips, checks or other patterns. 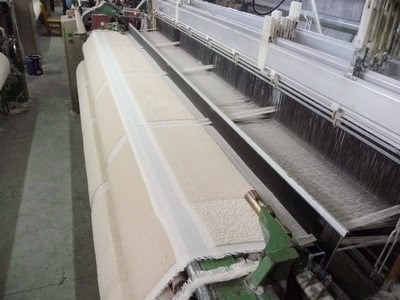 Special type of weaving technique is required for terry towel manufacturing. Terry towels are often very complex with yarns of different types and colors, in combination with various loop pile and flat structures. The name "terry" comes from the word "tirer" which means to pull out, referring to the pulled out by hand to make absorbent traditional. Turkish toweling Latin "vellus" meaning hair has the derivation "velour" which is the toweling with cut loops.